It’s really a season of fun more than just one day. You have to learn to pace yourself or by the time Derby Saturday rolls around, you are busted! Each year we go into Churchill Downs on THUR-by (the Thursday before Derby) or Oaks and watch the horses race. We wear dresses and fancy hats and drink mint Juleps trackside. As a local, going to the track on actual Derby is reserved for when you have folks visiting from out of town. 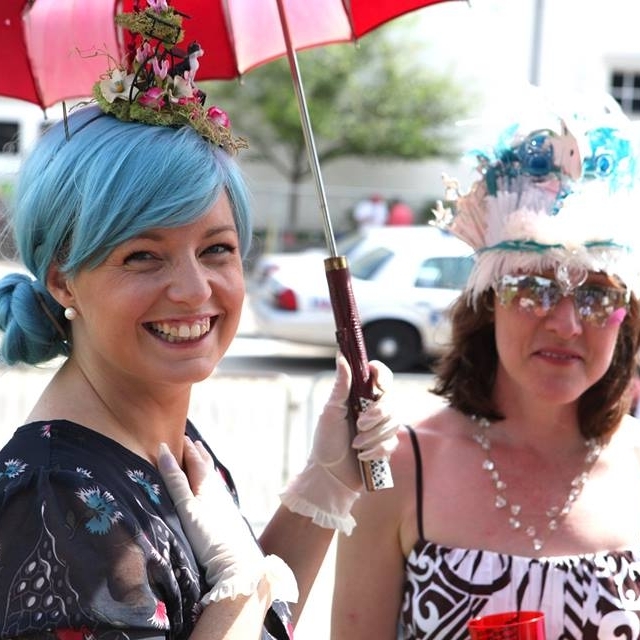 For Derby proper, Louisvillians have Derby Parties. Often times they are backyard pot lucks with side bets and TV set up for watching the race. Drinks flow and food is bountiful! Each year our friends set up a cheering section for those people arriving to the track. We call ourselves the “Compliment Society” and our main goal on Derby is to spread delight and to create inclusive, positive moments for people going to the track and for the neighbors of Churchill Downs. After the cheering is done, we dance at the street parties and set up a picnic in the grassy lawns across from the main entrance of Churchill Downs. We listen to the races by radio and have an afternoon that very much feels like the circus and the 1920s combined. Each year I pride myself on making the perfect Derby picnic and take joy in watching everyone light up when I pull out finger sandwiches and china tea cups. But this year I am totally drowning in work. Tomorrow morning I fly to California and come back on a red eye flight arriving Thurby at 10:21 am. I will head home, change quickly, then head to the track with our house guests who arrive WEDNESDAY! Truthfully I am wrestling with buying everything, because I personally attach my worth and value with my friend group to my ability to cook and entertain. I am including some recipes in case you find yourself with extra time and energy, but also know that specialty markets, Trader Joe’s, and local bakeries are an excellent way to have an effortless picnic! Combine the cream cheese and mayonnaise in a stand mixer fitted with a paddle attachment and mix until smooth—about 1 minute. Add the cucumber and red onion and mix until combined—about 30 seconds. Season with salt and pepper. Adjust the oven rack to the bottom position and preheat the oven to 400°F (205°C). Coat the bottom and sides of a 9- X 13-inch (23- X 33-centimeter) baking pan with cooking spray. In a food processor, pulse together the flour, butter, sugar, and salt until the butter is pea-sized. Add the water, 1 tablespoon at a time, and pulse until the dough begins to pull from the sides of the bowl. Transfer the dough to a floured surface, gather together and pat into a rectangle. Roll the dough into a ⅛-inch-thick (⅓-centimeter-thick) rectangle that measures about 13 X 15 inches (33 X 38 centimeters). Trim the rough edges and ease the dough into the prepared pan, pressing it onto the bottom and about halfway up the sides (trim the dough more on the sides as needed). Prick the dough a couple of times with a fork, then cover with aluminum foil and fill with pie weights or dried beans. Bake until the dough starts to set up—about 15 minutes. Remove the weights and foil and continue to bake until the crust is just golden—about 5 minutes more. Let it cool completely. Keep the oven preheated to 400°F. Beat the honey and brown sugar with an electric mixer until smooth. Next, beat in the eggs. Pour in the melted butter and continue to beat. Add the flour, bourbon, orange zest, and vanilla. Sprinkle the pecans and the chocolate chips over the crust and pour the honey mixture over the top. Bake until the top of the filling is golden brown and the center sets up—30 to 40 minutes. Cover and put in the refrigerator until cool. When ready to serve, cut into 24 even bars. In a medium bowl, beat together the mayonnaise and cream cheese. Stir in the cheddar cheese until well combined. Next, fold in the dill pickles, banana peppers, and piquillo pepper, and gently stir to combine. In a medium bowl, beat together the mayonnaise and goat cheese. Stir in the cheddar until the ingredients are well-combined. Next, fold in the red pepper and gently stir to combine. Season with salt and pepper. Remove from the heat and stir with a silicone spatula until cool—about 2 minutes. Stir in the eggs, one at a time, and then the vanilla until the mixture gets very shiny and smooth—about 2 minutes. Your arm may get tired, but 10 more stirs and you are done! Now rest for a second, and then fold in the flour. The batter will be very thick. Spray an 8- X 8-inch (20- X 20-centimeter) baking dish with nonstick cooking spray, then line it with two 14- X 4-inch strips of parchment paper. The parchment will make a cross in the bottom of the dish and raise out of the sides (This creates tabs that will help you remove the brownies from the pan later.). Pour in the batter and bake until the centers have just set—20 to 25 minutes. Cool completely. After you have added the Icing + Ganache to the brownies and are ready to serve, run a paring knife along the sides of the pan to release any chocolate or brownies. Then use the tabs to lift the brownies out of the pan. Using a sharp chef’s knife divide into 16 even pieces. Enjoy! To a stand mixer fitted with a whisk attachment, add the butter and mix on medium until smooth. Turn the mixer off and add half of the powdered sugar and mix on low to combine. I sometimes wrap a kitchen towel around the top to capture any flyaway powdered sugar. When the powdered sugar is incorporated, turn the mixer off and repeat with the remaining sugar. Add the cardamon to the bourbon and stir to distribute the spice. With the mixer going on low, drizzle in the bourbon mixture and continue to mix until smooth. Slather the icing onto the baked brownies and spread evenly across the entire top. Refrigerate until the icing is cold. When the icing is chilled, make the ganache. Place the chocolate chips in a heat resistant glass bowl. Add the cream to a small sauce pan over medium-heat and cook until it just begins to simmer. Pour the hot cream over the chocolate and let it stand for 2 to 3 minutes. Whisk the chocolate to make sure all the pieces melt. Cool slightly; you just don't want it to be too hot because that would melt the icing. Pour the melted chocolate over the icing and spread evenly to cover the entire top of the brownies. Place them back into the refrigerator and allow the chocolate to set up—about 30 minutes.